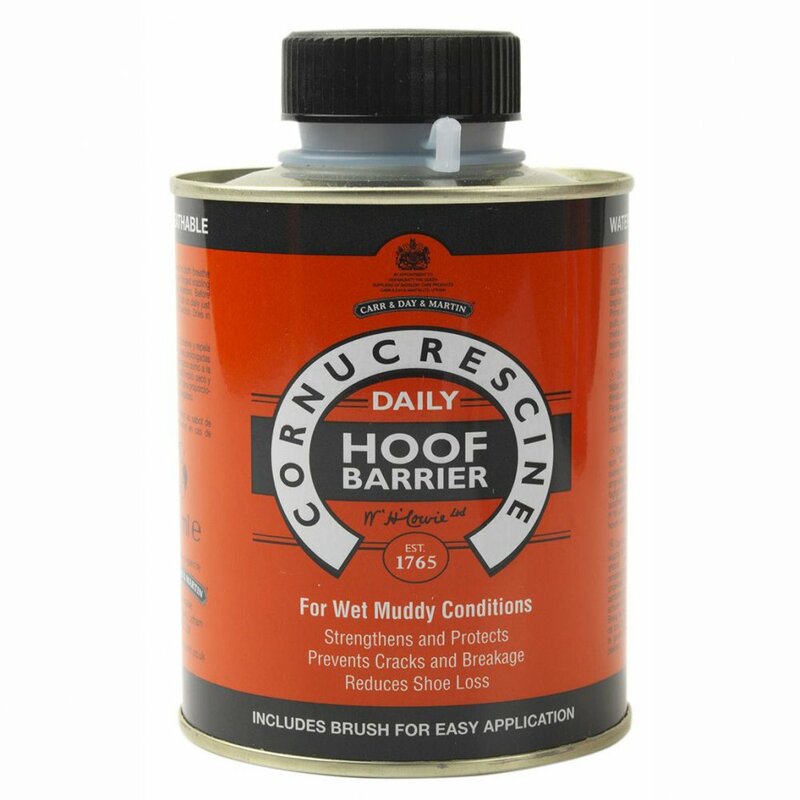 Cornucrescine Daily Hoof Barrier creates a waterproof barrier for the hoof to limit excessive absorption of water or urine. This advanced formula is a one-way barrier that waterproofs the hoof whilst maintaining breathability therefore helping to prevent soft and weak hooves. This Daily Hoof Barrier strengthens the horn naturally and supports a healthy hoof structure thereby helping to improve shoe retention. Cornucrescine Hoof Barrier also contains antibacterial agents to help limit bacterial infection and is designed for daily use to see maximum results. When applying Cornucrescine Daily Hoof Barrier always ensure the hoof is clean and dry, ensuring it is also free from all oils and greases. An application brush is included and should be used to apply Hoof Barrier to the hoof wall, sole, frog and heel as required, on a daily basis. Daily Hoof Barrier dries in minutes to give a clear finish and should be applied before exposure to wet and muddy conditions.